The model 4001 was a two pickup Deluxe version of the model 4000. The extra pickup was added to give a greater tone flexibility and a greater bass response. Triangle inlays, bound body and neck, triangle inlays. Rosewood fretboard. 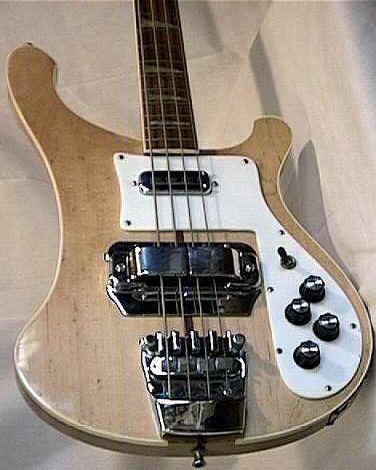 In the late sixties the factory also made some basses with ebony fretboard. Rick-O-Sound wasn´t standard in the sixties. 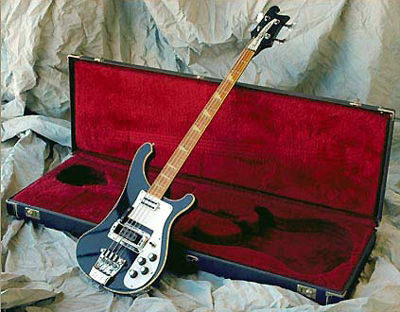 The R.O.S feature for basses first listed in price sheets 1971. 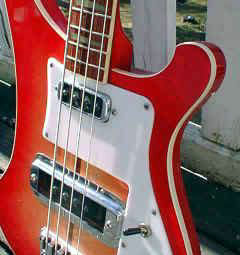 Note the placement of the bass pickup. 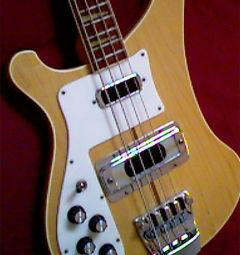 On models manufactured after 1974 it was moved closer toward the treble pickup. Compare the two photos above. What are the differences between a 4001 and a 4003 bass? "The 4001 ended sometime during 1980, maybe even '81. That overlaps too, but that's the difference between the catalog or price list dates which reflect inventory, and actual production dates. Without a doubt there are even a few 4001's with later serial number dates, which would been 'stragglers' through the production process or 'clear off the shelf' goods." "The string tension of a round wound string, especially a nearly pure iron string like those in the Roto Sound class, is almost 100 lbs. greater than a typical flat wound string. 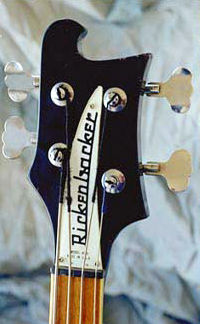 The 4001 neck was designed in 1956 for the only type of strings available then . . . flat wound . . . and since the design favored a slim neck, the neck strength was right on the edge of the envelope. Round wound strings took many of these instruments beyond their rated capability for string tension, resulting in various problems. But of course there are many types of strings, not to mention that every piece of wood is different, so plenty of 4001's have been used with round wound strings for decades with no ill effect. The best advice on these older basses is to use the light tension string you can stand. The 4003 has a completely different truss rod design and can handle any type of string you prefer. Fretwire has nothing to do with any of this, as we've always used the hardest alloy available. But it is true that a round wound string will tend to wear down any bass's frets faster." 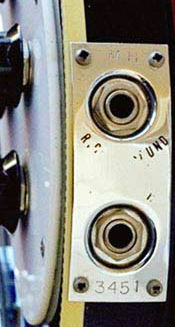 Model 4001 headstock and jackplate with R.O.S.